Congratulations Malcolm Ladley on completing your Kapap UK Self defence level 2 certification. As you know, this is an award that is provided by the Kapap UK Avi Nardia Academy to the team member who successfully completes their level 2 self defence instructor training. Malcolm has over 40 years of martial arts experience ranging from Karate, Kung Fu, Wrestling, Shotokan and full contact Kickboxing. Malcolm is a 5th Dan black belt in Wado-Ryu Karate and holds a 1st degree black sash in Kung Fu. Malcolm enjoyed training in full contact and over 10 years had 60 full contact fights. Malcolm has won the W.O.M.M.A world title and a silver and bronze in the WKC. 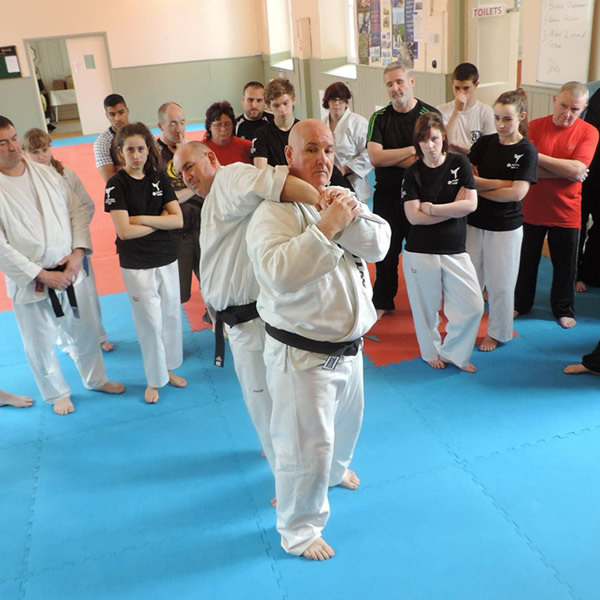 Looking for a new challenge and change of path in martial arts and after a bit of research Malcolm decided to take up Kapap in 2010 as he liked the fresh new approach that Kapap brought to self defence. Over the years, Malcolm has trained in different disciplines Throughout his martial arts training career Malcolm has always liked to bring different training methods and ideas to the dojo so that students get different ideas for what works best for them and this is what attracted Malcolm to Kapap with its bold and fresh approach to self defence with its simplicity in being able to adapt what ever situation may arise by using Kapap’s three main principles. Malcolm stuck to those principles throughout his training, and this has earned him his level 2 certification as well as being the lead Kapap Self defence instructor in Ireland. Malcolm runs his club in Dundalk in Co Louth in Ireland. This letter brings you my warmest congratulations. It was a privilege to present you with your Kapap level 2 self defence instructor certificate. It reflects highly about how hard you and your other Kapap UK colleagues are perceived in Kapap UK. It is an achievement that deserves recognition. I am proud to say that you are a valued member of our Kapap family. Kapap Instructor Update Training & Development.